I was flying to Santa Fe from Boston with thoughts of taking photos from sunrise to sunset. I love the light and, in the Southwest, there’s just something special about the way it falls softly and ignites the colors in the rocks and landscapes. Stroll around the shops of Old Town in late afternoon and the golden light warms each of your steps and covers you in a healthy glow. Outdoor vendors’ colorful, hand-woven blankets, jewelry and hanging chili peppers explode with color and texture! It’s a photographer’s delight! I never planned to visit, nor had I ever heard of, Acoma, the Sky City. However, a friendly, retired, talkative college professor happened to sit with me on the flight from Boston. Being a bit of a jabber jaws myself, we found ourselves engaged in lively conversation as we traversed the United States. I don’t believe we ever exchanged names, but then, we were merely travelers with time, sharing notes and interesting tidbits about the history and the special places found on the beautiful, blue orb 39,000 feet below us. He told me about visiting this ancient, sacred pueblo known as Acoma and he told me that I should not miss seeing it. With all the talking, the flight just seemed to fly, pun intended, and I arrived in Santa Fe with some new, must-see locales on my mind. The next day, I had some time alone plus a red, Mustang rental, so I set my GPS and headed southwest for Acoma. I was a little apprehensive because of its remote location and my fantastical ability to get lost. I figured getting lost in these parts would result in hikers finding my skeleton a hundred years later in a rusted Mustang with bony fingers still clutching an iPhone 5 – you know, that antique device that kids of 2116 never saw up close and personal. My fears, however, were unwarranted! I turned on to the long road leading to Acoma. There, before me, I saw giant rock formations huddled together, as if standing guard. Behind them, atop a mesa forty stories high were colorful, stone buildings all connected and all sitting under the clouds. I knew this would be an amazing visit. 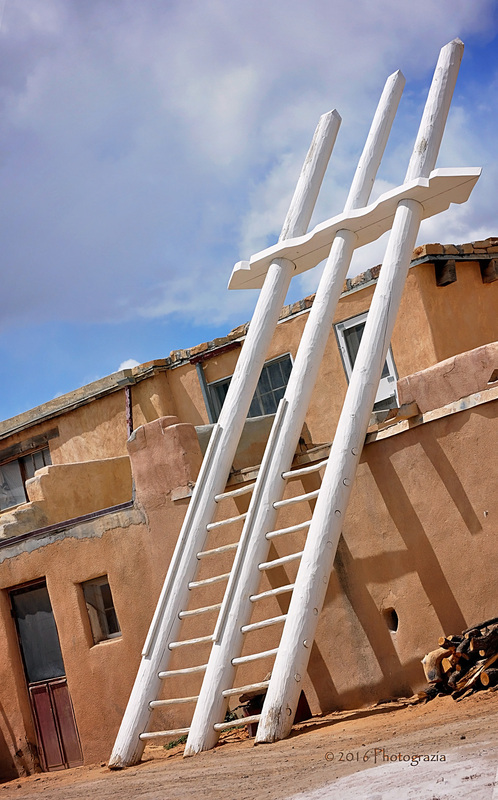 The Sky City Cultural Center and the Haak’u Museum offer great insight into the history and culture of the Sky City pueblo. Folks can see pottery made by Acoma artisans and grab something to eat at the Y’aak’a (means corn) Café. Everyone was friendly and questions were always encouraged. A bus takes groups of visitors, along with their guides, up the winding road to the actual pueblo. Because families still live there, groups must stay together and respect the privacy of residents. There is a thousand years of history on this mesa, some of it very violent, which makes it a very sacred place. 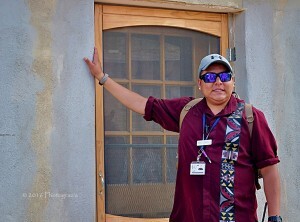 My group’s guide, Dakota, spoke with both pride and pain about the history of Acoma. According to the elders, “the Acoma people ascended from that center place in the underworld.” They are peaceful people in love with the land and the traditions upon which they were raised. The sheer height of the mesa made it an impenetrable defense for them. Enemies below were met with endless falling boulders and other weapons causing foes to leave the Acoma people alone. The first white men ever to see the mesa were the Spanish conquistadors traveling with Coronado in 1540. By 1599, the Spanish were taking control of the area, demanding that Native Americans conform to the Spanish way of life. Conflict arose and during a three day siege, the Spanish made their way to the mesa top. They killed 600 Acoma people and took another 600 as prisoners. One by one, they started murdering the prisoners and throwing them over the cliff. Males over the age of twenty-five were sentenced to have “one foot cut off and to give twenty years of personal service to the Spaniards.” The rest of the prisoners were sentenced to lifelong servitude. The village was burned. Their way of life destroyed. 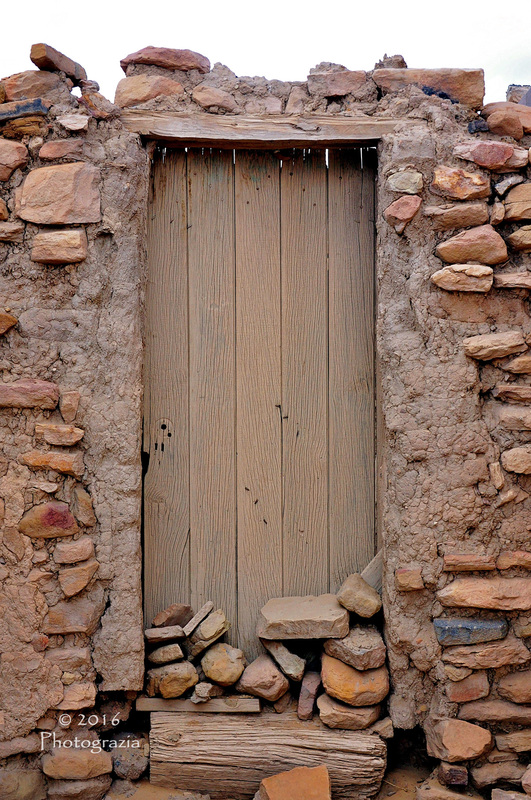 Thirty years later, the Acoma people started to rebuild. A huge mission was built and dedicated to St. Esteban, or St. Stephen. 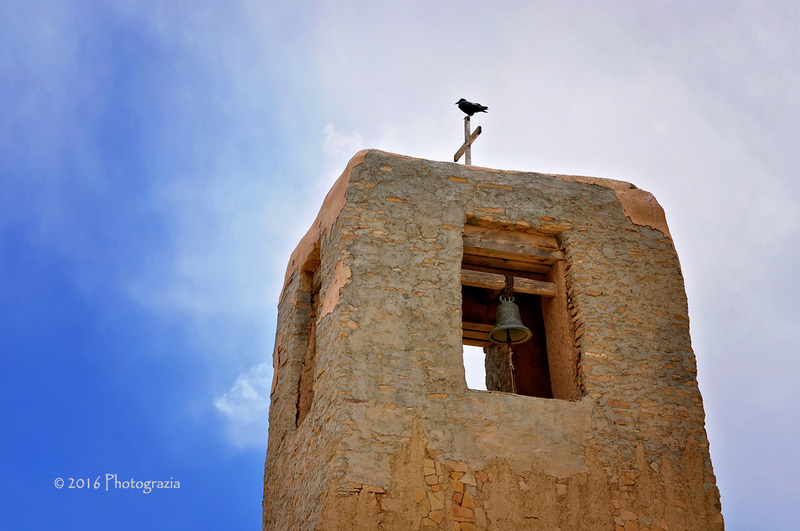 But Spanish Friars again began demanding that the Acoma people adopt Christianity as their faith. They were also subject to colonial rule. Native Americans, longing to keep their own cultures, beliefs and lifestyles, wanted the Spanish gone. In 1680, the Pueblo Revolt erupted as multiple tribes from across the area waged a bloody battle with the Spanish to hold on to the ways of their ancestors. 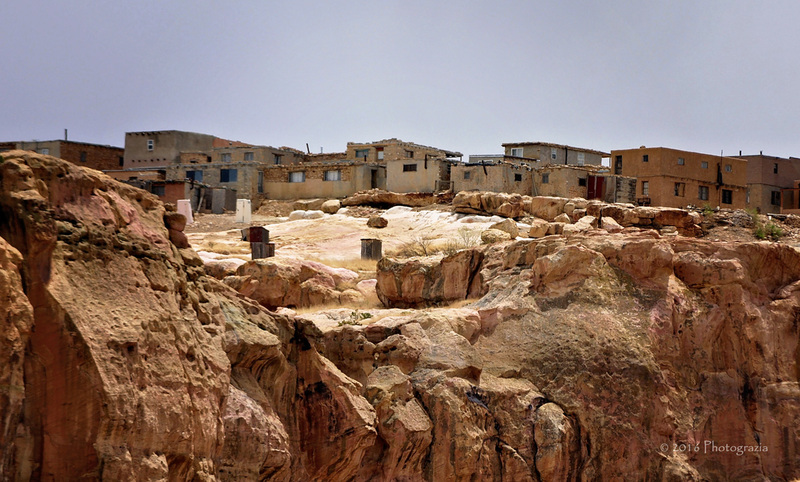 The Acoma people live in a matriarchal society. Women are the power in this community. They own the land, they make the decisions, they have the babies and they keep the old traditions alive. The women are respected. Men must walk behind the women. A matriarch can, at any time, decide to transfer her power. It is understood by all that the youngest daughter will then step up and receive the respect and power passed on to her. If there is not a daughter in the family, then it will pass to the youngest granddaughter. Once the torch has been passed, the elder matriarch can no longer live on the mesa. She can visit or attend celebrations, but her home is with others on the plains north of the mesa. This has been the custom for centuries. Dakota, my guide, showed us the house in which he grew up, but, he cannot live in, because his younger sister is now the matriarch. As you walk along the streets, it’s impossible not to notice the tall ladders leaning against the houses. Single ladders mean that they are merely access to the upper floors. If you see a double ladder, usually with pointed tips at the top, it means that the building is a kiva, a sacred meeting place. The ladder’s points are intended to pierce the clouds when rain is needed. What goes on in the kiva, stays in the kiva. 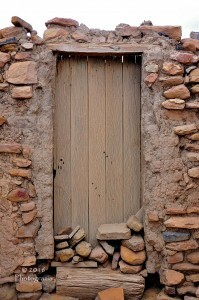 Nothing can be revealed about meetings, conversations, actions in the kiva. Acoma guides cannot even know. Dakota showed us little holes on the sides of several of the homes. No one could guess what it might mean. He told us that when groups of men were late in getting home, the women used to go over to the house where the men were gathered, lean down and scream their names in the little hole. It was kind of like their intercom! It also worked. Inebriated men scattered. After all, it is a matriarchal society! At one time, there used to be 2500 people living on the mesa. If my memory serves me, I believe there are only about 50 families now. On very hot days, residents will offer to sell visitors bottled water. I was thrilled to buy a bottle myself. Other residents set up tables and sell handmade pottery or jewelry. They do not live in luxury, but they have preserved the way of their people and would not trade it for anything. Could they modernize the mesa? Add running water and electricity? Probably. Could they swap out the coolers for refrigerators so that their food would be better preserved? Sure. Could they buy new clothes, shoes, iPhones? Absolutely. But they will never trade the values, the customs, or the beliefs that are so ingrained in their hearts and minds. They believe that they “ascended from that center place in the underworld” and they will never change their way of life. Ironically, they have what the rest of the world seeks…contentment, a knowledge of who they are, and the confidence to tell the world that they are proud of it. What a concept, huh?